It was a dark and stormy night… and there I was cycling into town on an errand. It’s 5.30pm. I’m almost at my destination I signal my intention to go left. I’m turning left (going across the bike lane in the other direction) and then wham, he hits me. I didn’t see him (obviously). Neither did he see me. His impact caught my front wheel with a good deal of force, I don’t believe he even applied his brakes. 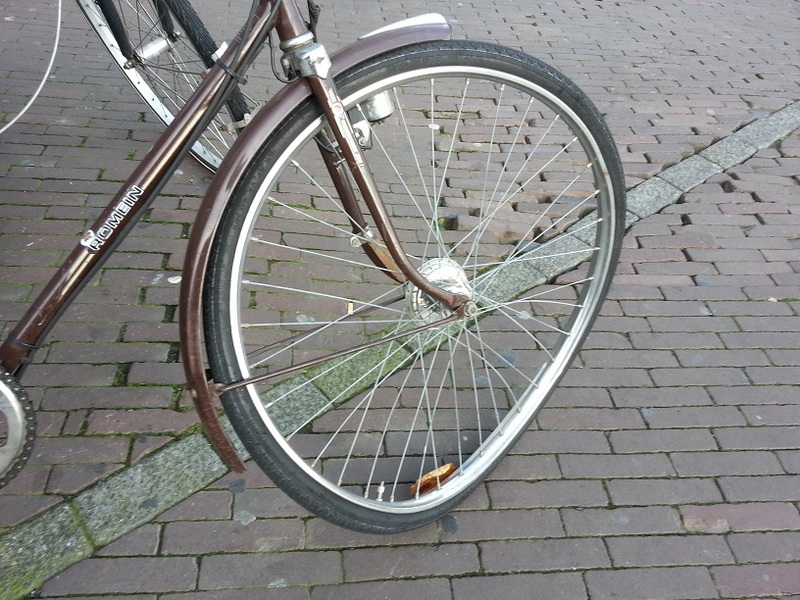 My front wheel crumpled under the impact. He didn’t strike me with enough force to knock me off my bike, but the effect of coming to a standstill so quickly, combined with the shock of being hit, I lost my balance and came off the bike. Balance in a stationary position is tricky – especially when I have my four year old daughter on the back! The other cyclist also fell off his bike in the collision. No-one was hurt, my front wheel never recovered though. None of us was wearing cycle helmets. Ben Goldacre posted this in the British Medical Journal, showing that there are a lot of factors that determine what makes cycling safer. What role the cycle helmet plays is hard to state. So why don’t the Dutch wear helmets? It helps that the infrastructure here is fantastic – plenty of segregated (physical curb or similar from road and pedestrian path) cycle paths, often only in one direction is a massive plus. However, there are plenty of roads, where the cycle path is similar to that in UK (painted along the side of the road) and of course many roads with no cycle path at all. It’s what happens here that I find interesting. On the road, cyclists have the right of way. So, I can be cycling down a narrow side street (no cycle lane) with a van coming the opposite direction. Often the van will slow down, potentially even stop to make it easy for me to ride past. If I need to turn left in a (non cycle paved) road, I can go into the middle of the road, signalling my intention and do it. In the UK, this in theory is also true. In practice, cars tend to sound horns, shout abuse at you and drive on the right or left of you as you might be costing them 5 seconds of their journey time. Here, along narrow bike paths, you’ll often come across two people cycling side by side chatting. If you want to go faster, ring your bell and they will allow you to pass. Cycling here is safer and more pleasant and slower. Everyone does it, not just men 20-45 in lycra, but women, grandparents and kids. Heck, even some of the 4 year olds in my daughter’s school ride to school (next to mummy/daddy of course), in the bike lanes/on the roads. The answer lies somewhere between the Dutch have a good cycling infrastructure and attitudes. This result is cycling is safe and pleasurable here. I started this post by explaining how I was hit by an irresponsible (in my opinion) cyclist who was going too fast (by Dutch standards) based on traffic conditions. Collisions happen. However, if those collisions are not at high speeds and the parties involved are comparable sizes, then chances are serious injuries are much less likely. Think about that time you were walking on the pavement and bumped into someone; it was a nothing event, right? Now if only cyclist collisions could be like that, outside of the Netherlands.